Americans Are Wary Of Genetically Engineered Foods : Shots - Health News Only 25 percent of Americans are completely sure they understand genetically engineered food. Nearly two-thirds are uncertain about its safety. A majority are willing to eat genetically modified plants, but only about a third would try altered fish. 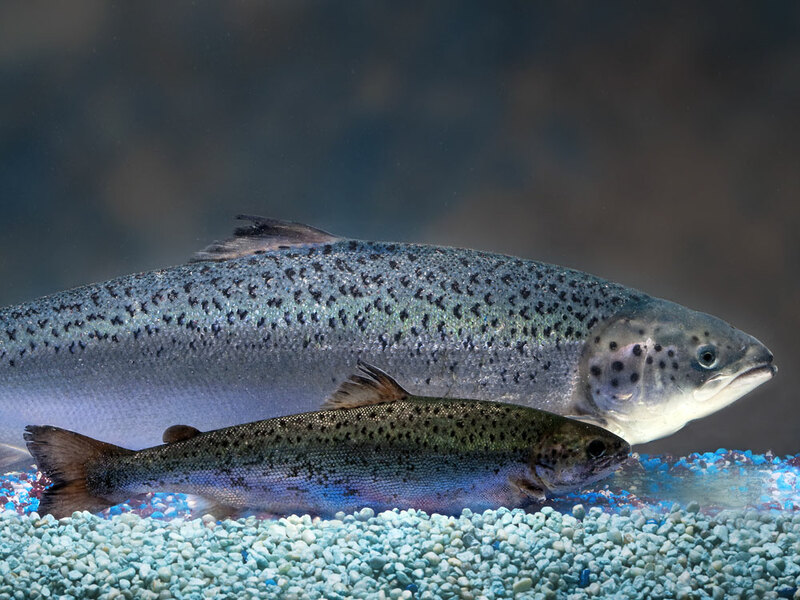 An AquAdvantage genetically engineered salmon behind a non-transgenic Atlantic salmon sibling of the same age. Would you eat a genetically engineered salmon? Are you even sure what the difference is between the regular variety and one that's been tweaked to grow faster? Don't feel bad if you're unsure. Only a quarter of Americans say they fully understand what genetically engineered food is all about, according to a survey of more then 3,000 people conducted for NPR by Thomson Reuters last month. Press people a little further by asking them if genetically engineered foods are safe, and the uncertainty climbs higher. Only 21 percent of people are convinced the foods are safe. Most are unsure — 64 percent. The remaining 15 percent think the foods aren't safe. People who are a little older, make more money and have at least a college degree are most likely to think safety is not an issue for the foods, whose qualities have been altered by laboratory manipulation of DNA. One thing everyone seems to agree on is that a food should say on its label if it's from some genetically modified animal or plant — 9 in 10 people surveyed said so. But that's not guaranteed. Unless there's a really important difference between the normal food and the engineered one, like, say, a change that could cause an allergic reaction in some people, U.S. regulators aren't in a position to require a label that says a food is the result of genetically alteration in the lab. Take, for instance, the fast-growing genetically engineered salmon being reviewed by the Food and Drug Administration right now. The agency has said there's no material difference between the flesh of the altered fish and the ubiquitous farm-raised Atlantic salmon in markets today. So don't look for FDA to require a special label, if it gives the fish the OK.
60 percent are fine with genetically engineered vegetables, fruits or grains. 38 percent said OK to altered meat. 35 percent would try a genetically engineered fish. Now you can't get the fish with tweaked DNA just yet, but engineered grains are kind of hard to avoid. From corn to tomatoes, the FDA has cleared the way for a wide range of modified foods. Overall, a little more than two-thirds of those surveyed said they knew that already. More than 80 percent of people with a college degree say they were aware that some modified food is on the market. By contrast, only 45 percent with a high school education or less knew that.